Two test pilots and a flight test engineer of the European Aviation Safety Agency (EASA) have completed training procedures and obtained Russian permission to fly for the certification campaign of Russia’s advanced MC-21-300 narrow-body twin jet. Participation of EASA test crews in testing of the new aircraft is a prerequisite to its final validation by EASA. The new short-to-medium range MC-21 is on a certification path in accordance with both Russian and international standards. The application for the type certificate of the MC-21-300 was submitted to the European Aviation Safety Agency in August, 2016. MC-21 validation is currently underway in 18 panels, established jointly with EASA. At the first stage of training, the EASA specialists have studied the MC-21-300 design and Flight Crew Operation Manual. A number of procedures were performed on simulators and test benches, including: take-off, approach and landing using both landing systems and visual approaches; handling qualities and controllability characteristics of the MC-21-300 aircraft in various control modes within the entire range of admissible operating altitudes, speeds, weights and centres of gravity; actions in case of emergency; approaching high angles of attack, when the stall warning activates. On completion of the theoretical and simulator training, the EASA specialists perform their familiarisation flights, during which they gain familiarity with the basic characteristics of the stability and controllability of the aircraft, landing approach and go-round procedures, including simulation of one engine failure. The theoretical and practical training of the EASA specialists was provided by test pilots and by leading engineers of the Flight Test Facility of the Yakovlev Design Bureau, which is a branch of the Irkut Corporation. 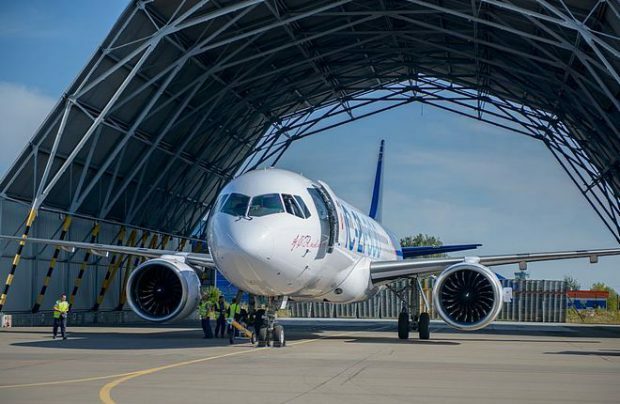 There are currently three MC-21 prototypes involved in the testing programme – two of them are flying, and the third is undergoing static tests at the Central Aerohydrodynamic Institute (TsAGI). Although both flying prototypes are powered by Pratt & Whitney PW1400G engines, a Russian-made PD-14 engine-equipped example will start testing in the second quarter of next year. The MC-21 family will include the163-seat MC-21-300 base model, as well as a shortened MC-21-200 version with a seating capacity for 132 passengers, and a stretched 212-seat MC-21-400 variant. The MC-21-300 backlog currently stands only at 175 firm orders.